Twenga is a free Windows 8 shopping app that lets you access millions of good shopping deals right on your Windows 8 desktop. Yupp..the popular online shopping platform, Twenga is now available as an app in Windows 8. Over Twenga Windows 8 app, you can make deal in best possible prices while selecting for any home appliance, computer tool, fashion accessory, housewares, any sports item, or any other item as per your requirement. The app lets you compare prices of a product with all other online shopping stores so that you can get the best out of it. The interface of the Windows 8 shopping app is very easy to understand. It has a tile based interface where the items have been categorized as Appliances, Computer, Fashion, Housewares, and Sports. Although, the app does come up with a decent number of categories, however, the number items in each categories are quite less. Yupp…the items displayed are the only ones that are available for you. 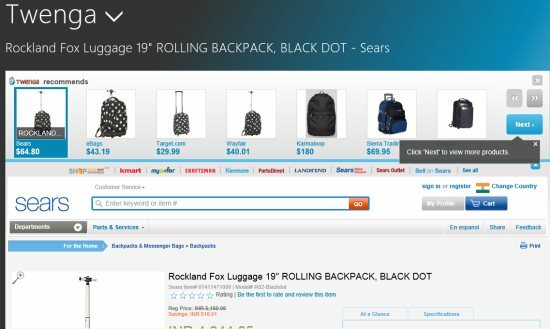 As you click on an item, it will quickly display the details of the item along with a link to the website where you can look around over other online stores to compare prices or to check out similar products. In short, Twenga is a fine Windows 8 shopping app to access millions of shopping products. I, somehow, did not like this app for Windows 8 because this you can do it in a better way through a browser. Go ahead, download Twenga available under the sopping category of Windows 8 and evaluate the results yourself.